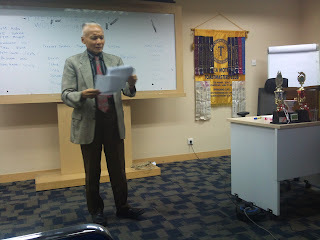 Last Wednesday I decided to force myself attend toastmaster weekly meeting. 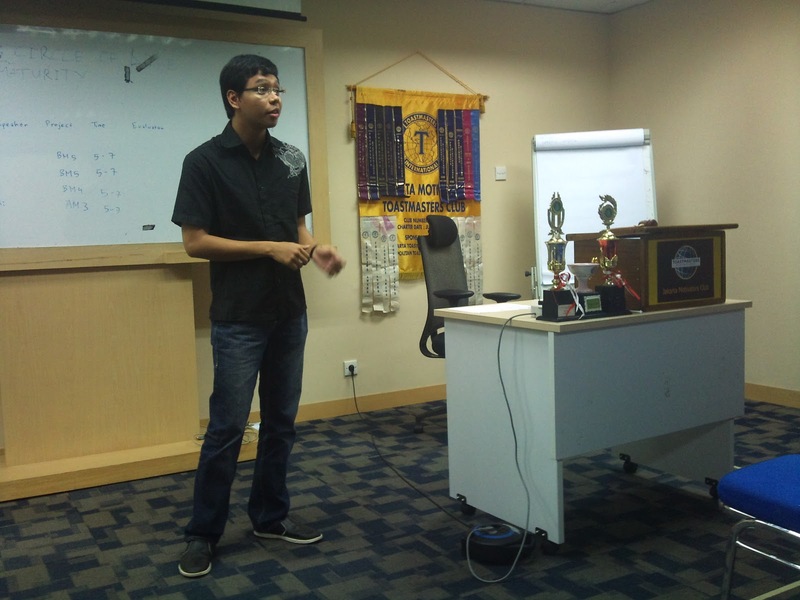 Toastmaster is international club that will help its member improving communication and some leadership skill. This club have so many many branches in many countries and cities. After doing some internet research I found the nearest club from my place of activity is at Nielsen, Mayapada building. The building only 5 minutes walking from my office at Sampoerna building and located exactly in from of my boarding house area. Actually I really want to join this club since long time. First time I heard about this club was from one of the book that I read. I forgot exactly either Steven Covey's or Brian Tracy's book. But since then, I speak to myself, one day I must join that club. The execution itself, finally just happen last Wednesday. My plan to continue post graduate study and the eager to be a better communicator are several reasons that force me to join immediately. One of the most important reason why toastmaster really can help us in improving communication skill is its friendly environment. Every members of the club either the new member, old member, experienced communicator and the one who still speak with nervous support so much for our improvement and learning process. There is no intimidating feeling. Even though nervous still exist we can push that feeling into minimum level. There are several important role for every toastmaster meeting. The first is ToM (toastmaster of meeting) the person who will host the meeting from start to the end. Second is General Evaluator, the person who will give general evaluation to all of the speaker. Third is grammarian, self explanatory, this person will comment about grammar usage of all the speaker. Fourth is timer, this role also essential because good public speaker must be have expertise in time management. Fifth is ballot counter, the role that has to count the best prepared speaker, table speaker and evaluator based on vote from all participant. Sixth, last but not least is "ah" counter, the role who is very unique but also very important, to analyze and make comment of pause filler or repeated word that is used by speaker. Guess what, my first visit to the meeting, I am granted to be a ballot counter. Not too big role, but I feel so honored doing that duty. At every toastmaster meet up, there are 5 main session. First is opening that consist of description all of the role involved during the meeting and also introduction of new guest that attend. Of course because yesterday is my first visit then I invited to the stage, with other guest to introduce myself to all of the toastmaster fellow. Second main session is table topic session. This session is interesting. The ToM will invite several participant to the stage to give some speech. The person who is invited must give speech that must consist 3 prepared words. Time limitation is 3 minutes. Of course with this method every person don't have any preparation at all and must spontaneously find the theme and speak up. Even though yesterday is my first time, unluckily I called to the stage to give table topic speech. Of course very nervous. Guest what, I get these three words for the speech: girl, relationship and breakup. I feel so embarrassed at the beginning, but at least I can speak up in front of audience. Hopefully can be improved when the time goes on. Third main session is prepared speech. This is main speech with 7 minutes time limit. The person who will give a speech already assigned before. I just can say, the three person that give prepared speech at that night is very awesome. For every prepared speaker, there is assigned an individual evaluator, beside general evaluoter mentioned formerly. Fourth main session is evaluation. At this part of the meeting every individual evaluator give comprehensive comment for every prepared speaker. After individual evaluator, later grammarian and "ahh" counter also give comment for every speaker. Last session is closing that consist of voting for every speaker and also guest impression to the meeting. Again, I have go to the stage to announce the best table topic speaker and evaluator. Also I give comment about the meeting. Of course even though I just attend the meeting one time, I feel quite sure the meeting is very usefull to improve my communication skill. I think that's all my sharing for now. Hopefully will be another sharing follows.